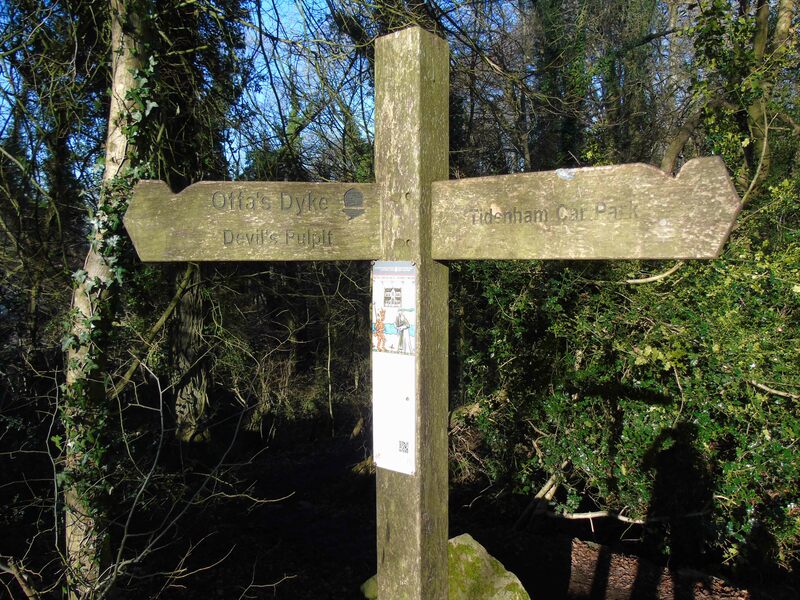 Back in March, I visited the Wye Valley to explore sections of Offa’s Dyke as it navigates along the high slopes above the river. 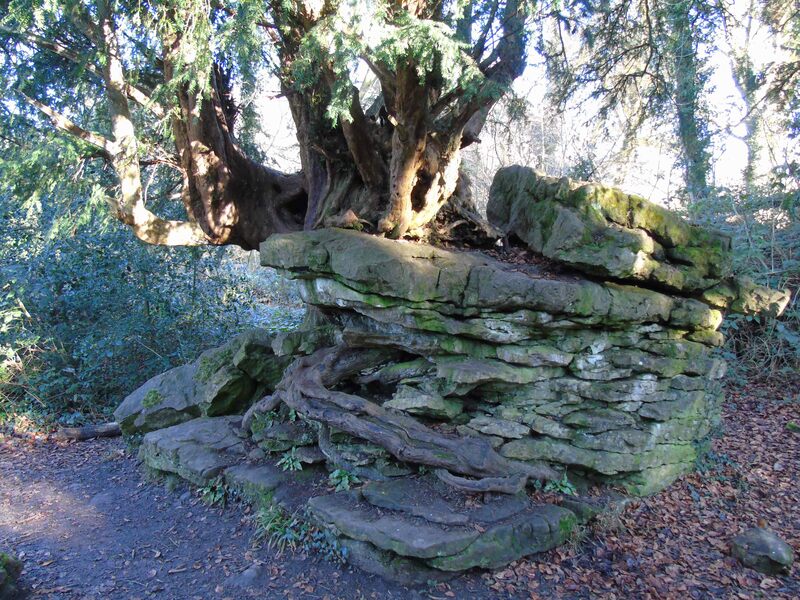 I thought this would be the best time of year to investigate it when leaves wouldn’t intercede in my views of the landscape, and hence my visit would enhance my appreciation of how the earthwork was interacting with topography and viewsheds. This was combined with the fact that the steep slopes and careful conservation measures for the dyke mean that at relatively very few stretches can one apprehend the monument from both below and above. Only for some of the distance can one walk on the dyke itself. Despite these restrictions, I felt this walk gave me a good sense of the scale and character of the bank and occasional ditch (where the latter is discernible and existed). 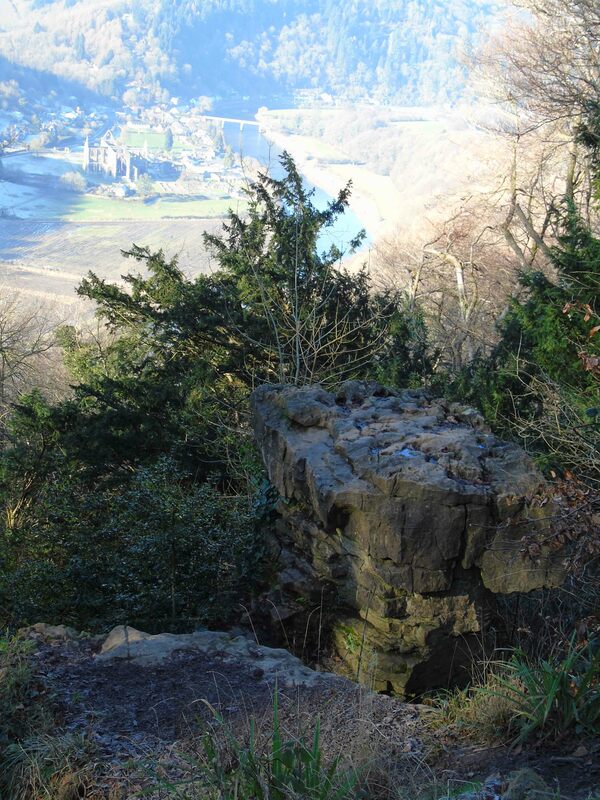 This section of the dyke is protected by English Heritage (in large part) and it is beautiful behold and enjoyable to walk it, especially the delight of seeing views over the magnificient Tintern Abbey from the Devil’s Pulpit. I gained a sense of how the dyke would have dominated the valley to the west. 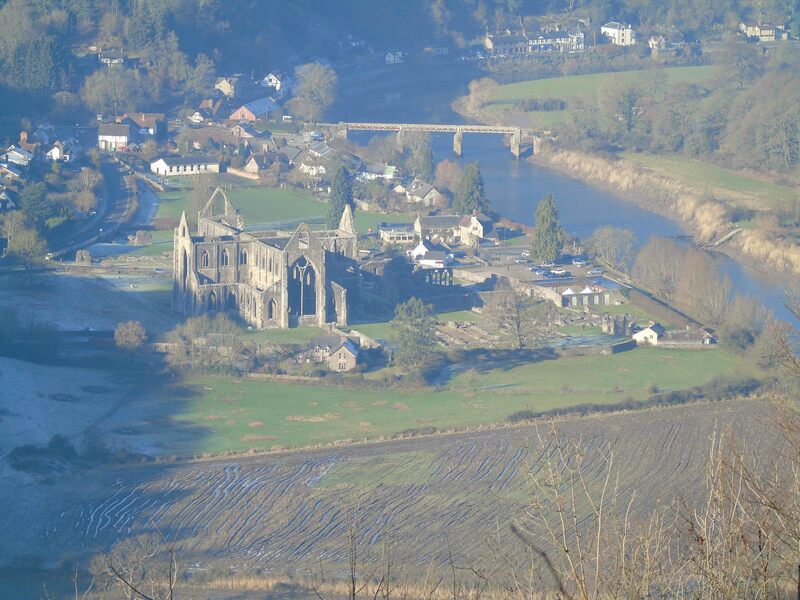 Perhaps it was also intended to dominate from locations like Tintern, especially if the Cistercian monastery had overlain earlier Welsh ecclesiastical and/or secular elite foci (of course there is no direct evidence surviving for this, but it is a suggestion of Ray and Bapty 2016). 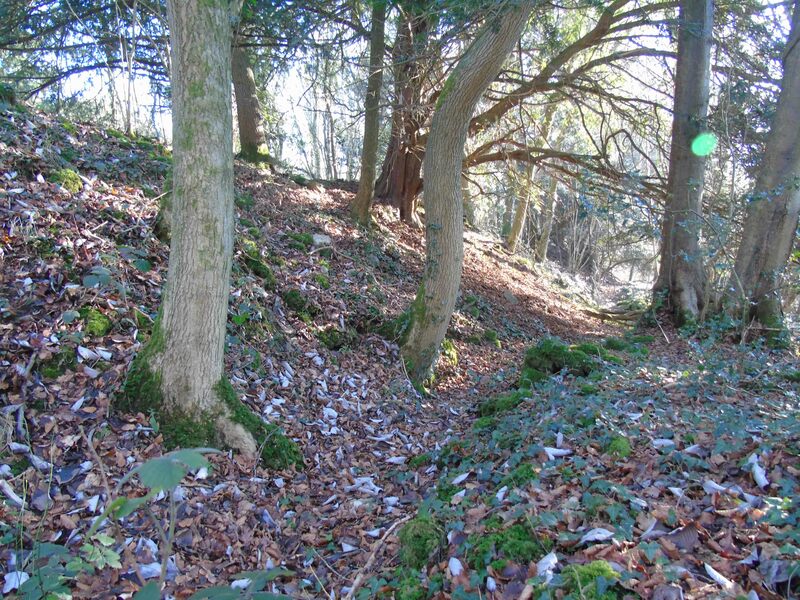 Presumably its creation would have involved the clearance of large tracts of woodland along these slopes, as well as cutting the ditch and raising the bank and another structures situated upon it. The line of the dyke follows the contours, but also adapts itself very particularly to allow regular points of observation. These lookout points would have operated to ensure full surveillance over land to the west and we can but wonder how they were originally equipped. 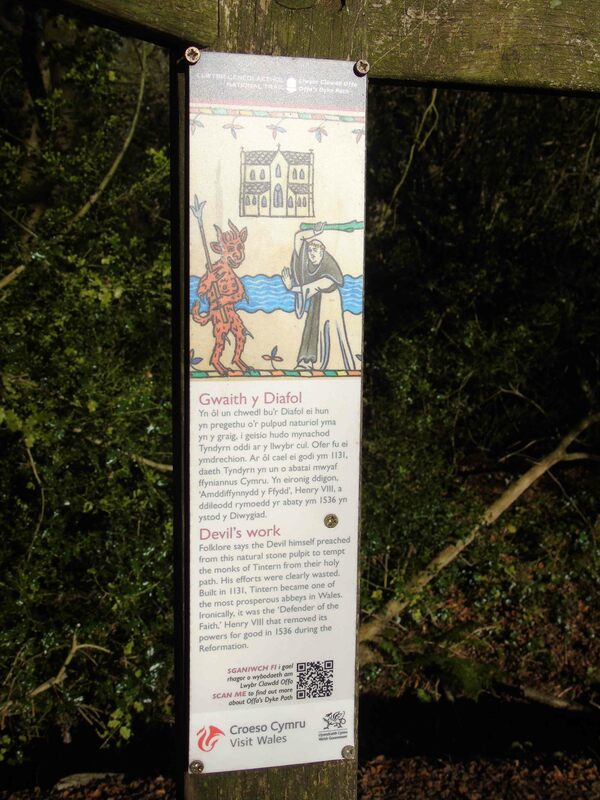 They are perhaps at key situations where there are angle-turns along the route from Tiddenham Wood to Madgetts Hill – namely at the following points; Plumweir Cliff, the Devil’s Pulpit, Lippets Grove and just west of Madgetts Hill itself. Controlling these point would allow visibility along the dyke as well as forward of it into the valley. The only one of these that affords views through the trees today is the aforementioned dramatic view over Tintern Abbey from the Devil’s Pulpit. As previously discussed for my walk from Bigsweir to Redbrook, evidence of significant quarries were discerned, including at the Devil’s Pulpit and Tidenham, and these might be readily surveyed in the future using Lidar. Indeed, the Devil’s Pulpit might be created, in part, by the exageration of the natural topography by the dyke’s ditch and quarries. 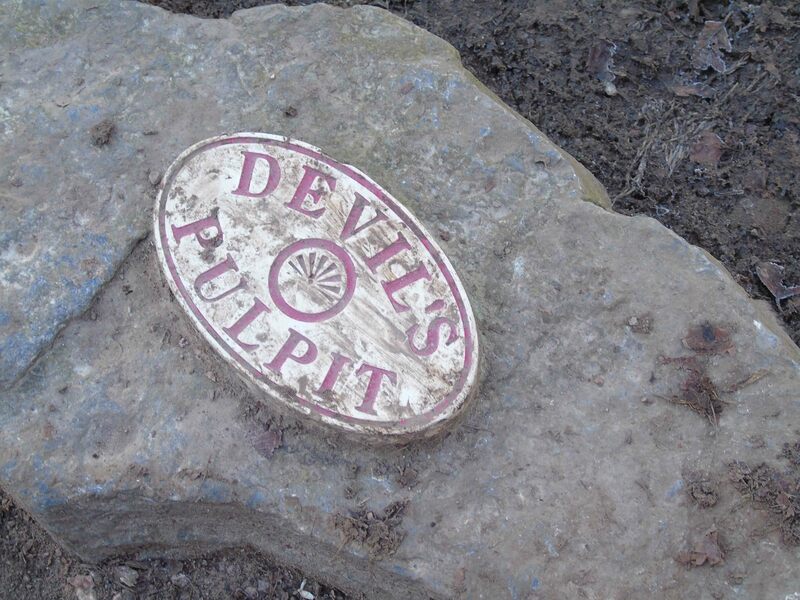 The Devil’s Pulpit was also interesting for its striking topography and for the miniature sign evoking the folk tale of this being a demonic spot: the rock used to tempt the Cistercian monks below. I’m not sure of the antiquity of this tale but it is nice to see story linked into the line of Offa’s Dyke. 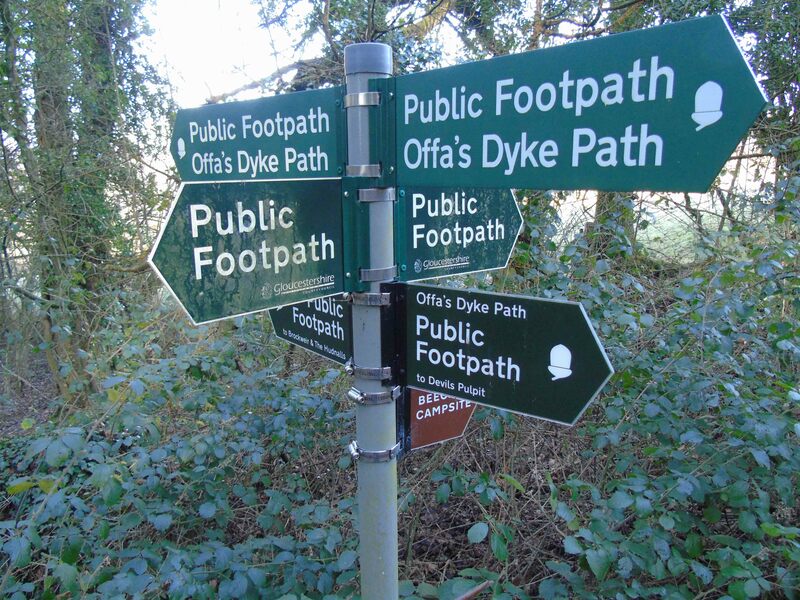 This leads us yet again to the contemporary material culture of the Offa’s Dyke National Path. The genealogy of signs, from wood to metal is one dimension observed. Finally we come to the question of its monumental scale and ‘behaviour’. 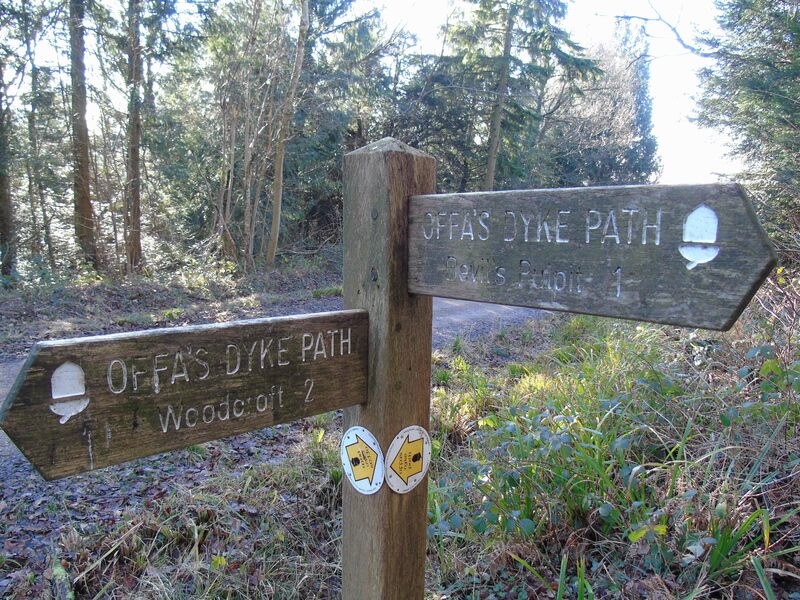 Ray and Bapty (2006) argue that the way that the dyke behaves here is comparable to its emplacement in North Herefordshire, Shropshire and further north. While the dating of the dyke remains unclear, I cannot but agree in general terms with these observations. The scale, behaviour and components seem very similar to pieces of the earthwork I’ve seen further north, taking into account that both Offa’s and Wat’s dykes appear less monumental when they hug steep slopes on account of erosion and other taphonomic processe. Still, we lack dates and details: was it built by Offa or another ruler(s)? Overall, this is an essential piece of Offa’s Dyke worthy of exploration and readily done within a day walking from Tintern or Tidenham.